This year the National Testing Agency (NTA) will conduct the Common Management Admission Test (CMAT). The CMAT 2019 is one of the prestigious exams of the Management. It is a national level management entrance test. It will be an online mode computer-based test. The application process of CMAT 2019 was also take place online at the official website, i.e. nta.ac.in. The CMAT 2019 exam will hold on January 28, 2019. As a result of CMAT 2019 computer-based test candidates will be called for GD/PI, and WAT (Written Aptitude Test). On the basis of all these stages, NTA will announce a Merit List containing the names of selected students for counseling round. 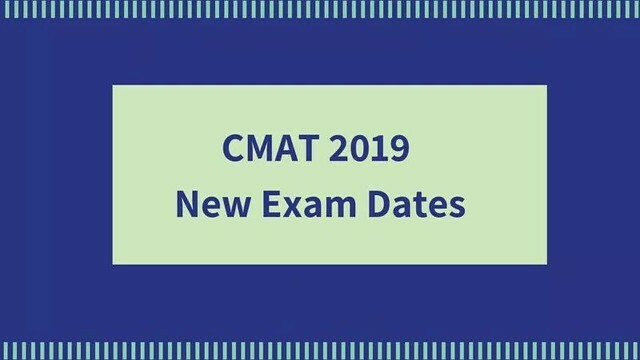 To get the detailed information about CMAT 2019 such as Application process, admit card, exam pattern and much more. As per the previous year’s data, approximately 590000 candidates participate in CMAT. Generally, the toppers are those who achieve scores between 315 to 350. It is expected that the Syllabus and Exam Pattern will remain the same. In case if there will be any changes, we will update here. The candidates can check the schedule of CMAT 2019. NTA set Eligibility criteria for the aspirants of CMAT 2019. The candidates must ensure the eligibility in order, to begin with, the application process. Candidates should be graduated in any discipline from a recognized University/Institution. Final year students can also apply for it. The candidate of any age can apply for this exam. There is no age bar. There is no limit to the number of attempts. The Application form was released at the official website of NTA, i.e. nta.ac.in. Students who are meeting with the eligibility only they can apply for CMAT. However, the application process is over. The application process was taken place in online mode. Offline applications via post are not at all acceptable. Candidates must fill the application form carefully. They must fill in the valid information in the form. As there will be no chance to re-edit or correct any information after the submission. When you successfully fill out all the details in the form, thereafter you will have to pay the application fee. The application fee is non-refundable. The mode of payment is also online and must be done via Credit/Debit card, Net banking, or E-wallet. The Admit Card for CMAT 2019 will also release online at the official website. Students who have completed the application process precisely only they can get their CMAT Admit Card. The students will have to log in through their Application ID and Password in order to generate the Admit Card. An Admit Card is a mandatory document that every candidate should produce it at the time of the exam. A candidate is suggested to take out a colored printout of the Admit Card as it shows the clear image of photograph and signature. Candidates must check if all the details mentioned on it are correct or not. In case of any discrepancy, rather making corrections you should immediately contact the higher authorities. An Admit Card states the basic information of the candidate and exam center as well. As we know that CMAT is one of the esteemed exams of Management. It follows a precise exam pattern. As per the last year, there will be no change in Exam Pattern or CMAT Syllabus will take place. Aspirants can check the exam pattern elaborated below. Duration of this exam will be 3 hours or 180 minutes. Questions will be objective type (MCQ). There are total 4 sections. 4 marks will allot to the student for every correct answer. 1 mark will be deducted for every wrong answer. No deducting and allotting of marks in case of unanswered questions. Students must take the Online Trial Test. As a result, the student will get familiar with the exam pattern and the marking scheme. It will help the students to get an idea of layout, design and navigation functionality for the CMAT 2019. The Answer Key for CMAT 2019 will also release online. An Answer key will be out live after 1 or 2 weeks of the exam. The Answer Key will be set-wise. So students can check it according to their exam day and time. To check the Answer Key candidates will have to log in with their Roll number and Password. Thereafter, they can view or download the Answer Key. It is an advantageous source as it helps you in predicting your probable scores. The Result of CMAT 2019 will release online on the official website. CMAT Result 2019 will contain the aggregate marks of each round such as CBT, GD, PI, and WAT. Candidates who appeared in all the levels of the CMAT 2019 can check the Result. Firstly, candidates have to log in by entering their Roll number and Password. The Result will be in pdf format. It will contain the list of students selected for counseling round. After the declaration of Result and Merit List candidates will call for the counseling round. You can attend the CMAT counseling in the college/institute of your preference. On the basis of score and ranking of the student, the admission will be decided. It is necessary that you carry all the relevant documents along with you at the time of counseling. Students can pay the admission fee on the same day as counseling. Furthermore, candidates can approach the college/institute directly without the need of attending the counseling. In case if NTA makes any changes in regards to CMAT 2019 then we will update on this page. CMAT AND GPAT Examinations are overlapping. Most of our students are appearing for both Examinations. Sir, can you please give me some tips to crack cmat 2019.